Sign up for Weekly Showtimes, Events and Internet Specials only available to Insiders! Would you like to become a Premiere Insider? Yes! No, Thanks! Your IP address (3.91.157.213) is logged and will be traced back to you if you send falsified data. 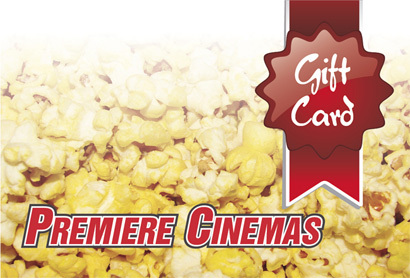 The Premiere Cinema Gift Card is available in any amount ($25.00, $50.00, $100.00, etc.) with a $10.00 minimum.in store. Online cards are available in any amount over $25.00. The Premiere Cinemas Gift Card makes a great present for that special person in your life! Perfect for Holiday gifts, stocking stuffers, graduation presents, birthday presents or just fill them up to hand off to the kids for cashless movie-going. When your balance runs low, simply reload at the box office or the concession stand! 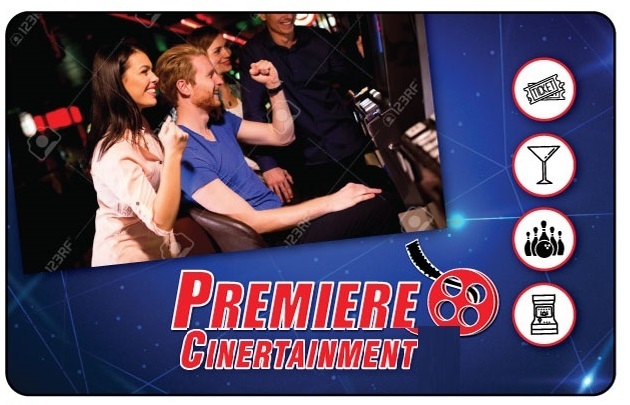 Locations with Intercard Arcades - please note that Premiere Cinemas gift cards work on all aspects of the location (Tickets, Concessions, Restaurant, Bowling and Ropes). The only area that this card is not valid for is the arcade. Going to the movies without cash has never been easier! Why go to the movies without being rewarded? The Premiere Cinemas Gift card can be exchanged for a rewards card at any time. Simply ask your friendly Premiere Cinemas crew member that you'd like to start being rewarded! If you don't have one already, ask about getting your own Premiere Rewards Card! Get rewarded for your movie-going experience! Ask any crew member about joining the Premiere Cinemas Rewards Program or click above to request one! Simply present your Card on every visit when purchasing tickets and concession items. Items never expire and stay on your card until they are used! The best part? This program is 100% FREE! The Premiere Cinemas Rewards Card can also be used as a reloadable cash card or as a gift card - a present for that special person in your life! Perfect for Holiday gifts, stocking stuffers, graduation presents, birthday presents or just fill them up to hand off to the kids for cashless movie-going. When your balance runs low, simply reload at the box office or the concession stand. If you want a great time at one of our Cinertainment Complexes, make sure to head to the Game Card kiosk! The Certainment Game Card can be used on all arcade and redemption games. At facilities with bowling, you will be able to use these cards at the concession stand, bowling counter, ropes course and even the pizza pub. Just reload and go for easy cashless family fun!